Welcome to our shop....we are so happy to have you shopping with us! Take your time and browse. If you have any questions, please don't hesitate to ask. We love to answer questions about our products....after all, we created them and we LOVE to tell you about them! We try to reply to all messages within 12 hours. We are on Facebook too....Members get special offers and chances to test and review products BEFORE they are released AND this is were we hold contests and giveaways....always lots of fun stuff going on! PLEASE NOTE: We refund shipping differences of $1.00 and over. Goat Milk Soap, Lavendar Soap,Hand Crafted Artisan Soap,Essential Oil Soap, Wholesale soap, Homemade Soap,All Natural Soap,lye soap. Lemongrass Soap - Lemongrass - Essential Oil Soap - All Natural Soaps - Vegan Skincare - Vegan Gift - Bath Soap - Artisan Soap - ONE BAR. Homemade Goat Milk Soap, Cinnamon Soap, Exfoliating Soap with a Warm, Spicy Sweet Fragrance. Soap, Goat Milk Soap, SANDALWOOD VANILLA, Sandalwood Soap, Vanilla Soap, Sandalwood Vanilla Soap, Cold Process Soap, Vanilla Sandalwood. Soap Sampler, Soap Variety Pack, Soap Samples, Soap Slices, Soap Ends, Soap Odds and Ends. Unscented Soap, SENSTIVE SKIN Goat Milk Soap, All Natural ,Unscented, No colorant, no scent. BEER SOAP, Beer Soap Bar, Beer Lover, Craft Beer Gift, Home Made Soap made with Straub American Lager. Goat Milk Soap. Honey Oatmeal soap. All Natural Unscented Goat Milk Soap or Oatmeal, Milk & Honey scented. With CERTIFIED SUSTAINABLE PALM. 2 oz Goat Milk Lotion. THICK and RICH skin cream contains Shea Butter, Jojoba oil, Avocado oil and glycerin. Perfect for all over your body. Taking advantage of the BEAUTIFUL lilacs for some perfect photos! Solid Lotion Bars. 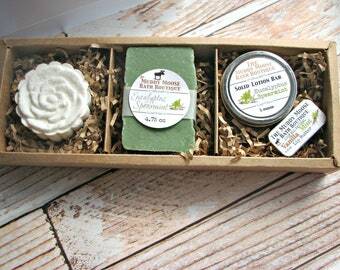 4 Lotion Bars in tin, Your Choice of Scents. NEW in the shop today! Pouring cold process soap into the soap molds. The Muddy Moose Bath Boutique, a small cottage industry , started out just like you might imagine: as a hobby. I wanted to learn how to make REAL SOAP....you know, using lye and everything. This desire set me on a quest, to learn how to do it the right way. I became, well, obsessed with everything soap making. I would like to dispute the fact that I was obsessed, but my husband would have to say otherwise. So I read and reread soap making books, researched online, talked to other soap makers and joined many online soap forums. Once I had compiled all the proper equipment and had the ingredients, it was time to make my first batch. So on Christmas vacation one year, my sister-in-law, Cathy, and I set out to do just that. We stirred and stirred and stirred some more and finally that magical moment arrived: trace. This is the exciting stage during the soap making process that you get to add all fun stuff into your soap: herbs, scents, oatmeal and just about anything else your heart desires. Now, I can't necessarily attest to the qualities of that first batch, but we had achieved what we had set out to do: make soap. And I can't really say whether addictive personalities run in our family or if it is just my inner chemist coming out, but I must admit from that point on, I was hooked! So, I started doing more research. I began to learn which oils contribute special properties to the soap. And each time I learned something new, I would break out the soap pot and begin to create! Now, for those of you unfamiliar with how to make soap, you simply cannot make a single bar of soap...it is make in small batches. So what ended up happening was with one fell swoop of the soap stick, I would have 13 bars of soap....and that can add up FAST! Just ask my husband....I slowly began encroaching into his "man cave". So I started to give it away. I gave it to family.....to friends.....to friends of friends....heck, I even gave it to complete strangers! (OK,OK...maybe that last part is a bit of an exaggeration...but you get the point) Then something strange started happening....just when I thought people would start to run when they saw me coming.....THEY started to come to ME...ASKING for more soap! That is when I had what you call my "AH-HA moment" and the rest, is well, history! I may store and process your information through third-party hosting services in the US and other jurisdictions. As a result, I may transfer your personal information to a jurisdiction with different data protection and government surveillance laws than your jurisdiction. If I am deemed to transfer information about you outside of the EU, I rely on EU-US Privacy Shield and SSL Security to encrypt and transfer securely any data from the EU, as that is what Etsy uses. We gladly offer custom, personalized favors. We also can add your logo to any of our items for private label to offer in your bed and breakfast, cabin, business or retail store. All label design and printing is done in-house so we are able to work closely with you to design something special just for you. Message us for pricing and further details. We gladly offer wholesale pricing, please feel free to contacts us for pricing and our terms and conditions. We do it all! We have carefully formulated each and every product recipe, meticulously analyzed the each product, and once we are completely satisfied with the end result, we release the product to the public for purchase. We only use high quality ingredients and obtain as many local ingredients as possible. We never test on animals. Do you offer expideted order processing and shipping? Our current processing time is 5-7 business days unless otherwise specified in the listing. If you are needing the order in a hurry, please contact us and will gladly work with you to speed your order along in any way we can. Upgraded shipping is available. Additional costs may be incurred.